In Part 1 I explained how I used a 7 Step Action Plan to conquer an irrational fear I had about riding “the scary corner” on my mountain bike. While everybody else seemed to effortlessly glide round the corner at speed and then over or around the craggy rocks as they exited on an uphill slope, I’d turn to hike-a-bike mode. I had previously ridden this corner, but somehow the fear escalated and made me feel very small and incapable. The Scary Corner is quite photogenic! It really doesn’t look so scary here! The same 7 Step Action Plan that I used to conquer my fear on “the scary corner” can be applied to other scenarios in ordinary everyday life. Here’s how….. Think it through calmly. Maybe talk it through with someone. Stay rational, logical and reasonable. Are there skills or equipment that will help you be successful? For example, learn how to make small talk, have a dot point list in front of you, play music through your headphones. Would it help to ask a friend to accompany you, place your chair near the exit, or use the phone on speaker so your hands are free? Refocus your attention on what you want to happen, where you want to go, what you want to say, how you want to feel. The scary thoughts or feelings will keep popping up, but don’t give them the attention they are seeking. Keep refocusing. Have an exit plan. If things get too much, what will you say, what will you do, where will you go? Knowing there’s a safe and valid way out brings a greater sense of ease and improves your rate of success. This is where you just do it. Every thing’s in place. You have a plan. Trust it. Trust yourself. What’s the worst that could happen now? Your reward for stepping up to the challenge my be felt internally with a surge of relief or confidence. Or perhaps you’d like to reward yourself in another way. Remember, everyone feels nervous about something at least some of the time. It’s a normal mechanism designed to keep us safe, but if it’s keeping you small, then it’s time to do something about it. If your nervousness is impacting heavily on your functioning or contributing to ill-health, you can seek support from your GP to access counselling. Counselling is a bit like having a coach provide step-by-step guidelines and support as you learn new skills to achieve your goals. I knew I was physically capable of doing it, I’d done it several times in the past. So what was getting in the way of me ACTUALLY doing it NOW??? Over a period of a few months, the idea of riding “the scary corner” on my bike loomed bigger and scarier and I felt worse and worse. I don’t know what had changed in my mind – nothing had changed on the trail, so I figured it was some sort of powerful intra-psychic voodoo playing with my confidence and keeping me feeling small and pathetic. I couldn’t even blame it on a fall or anything like that! 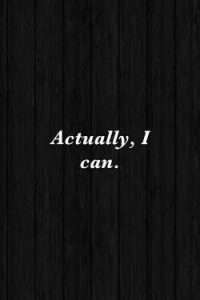 After much soul searching, I made the commitment to myself that I was going to conquer the fear that had irrationally built up in my mind. I really wanted to take charge of my fearful thoughts which seemed to be controlling my actions. It was as if my own thoughts were bullying me. The longer it went on, the worse it became. I knew that if I could get this sorted, I’d be able to transfer the skills and processes to other situations that make me nervous and better manage them as well. That’s right. The first thing I did was leave the bike behind, put on my sports shoes, and simply walk the corner – repeatedly! I familiarised myself with every stone, stick and slope. I walked it forwards and backwards. I looked at it from every possible angle. “The scary corner” and myself got to know each other well, and we gradually became friends! By getting down close and personal with the scary corner I was able to see that there was, in fact, nothing in it that I couldn’t ride. Tight left bend – check. Six inch drop over a rock – check. Angle of slope – check. Width of trail – not a problem. Nope ….. I wasn’t missing any particular skills apart from the ability to curb the fantastic stories my mind was creating about how scary the corner is! And as for equipment, well my bike is well maintained and more than capable of negotiating this terrain. I’d been noticing that other people often lowered their seats when descending. 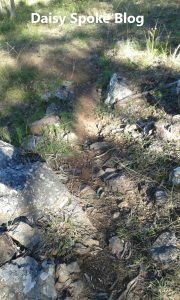 I also noticed my own urge to get my weight lower and further back on similar corners on other trails. 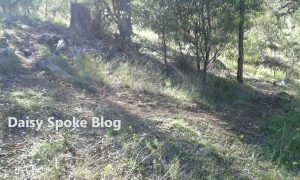 So, I lowered my saddle and instantly felt a lot more secure about my body position on rough descending trails. This triggered a whole new attitude of positivity and hopefulness. Keep your eyes on the sticks, NOT the cactus or the steep slope or the rocks! Our eyes are naturally drawn towards danger. It’s a protective mechanism which sometimes backfires on us. Mountain biking is often counter-intuitive. If you focus on the obstacle, that’s where you’ll go. To help train my eye away from the steep slope, rocks and trees that I wanted to avoid as I approached the corner, I lined the ground on the right side with small twigs to act as a visual aid (a bit like the white line marking on the road). Then I walked the trail again and again, practising keeping my eye on the twigs and not looking at the stuff I wanted to avoid! 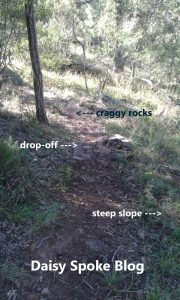 Practise the technical parts of the exit – keep on track, get over the drop-off, & time your peddling to get past the craggy rocks as you go back uphill! I now began to think about actually riding the corner. But there were a couple of tricky parts and I noticed a feeling welling up inside me – the fear of getting halfway round the corner then getting trapped because I mightn’t be able to exit properly. 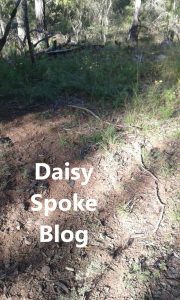 I visualised myself falling off on the rocks and knocking my head on a tree as I tumbled down the slope and through the prickly pear. So, I needed to do something to allay my concerns. I set to work practising my exit skills on “the scary corner”. Repeatedly I walked my bike halfway round the corner so I could ride the second half of it only, over the drop-off and carefully navigate between the large protruding rocks, timing my pedal strokes just right so that I didn’t knock myself off. This built a lot more confidence and eliminated a few of the scary factors that had been distracting me. A short steep downhill section between and over the rocks forms the entry to the sharp-ish left hand corner. Well now that I knew I had it all together in my head and that I could physically do it, all that was left was to make my entrance. Get down low and go, go, go! I think I even remembered to breathe, and suddenly I’d done it! In a brief second or two, I’d successfully navigated “the scary corner” and wondered what all the fuss had been about! It may seem trivial to other people, and you may be the only one who truly knows what your achievement means to you. But don’t let that stop you from learning, practising, growing, and celebrating. Whatever your style – whoop out loud to the universe, punch the air, pat yourself on the back, or maybe even write a blog about it! What things make you feel nervous? Maybe going to a meeting or party where you’re not sure if you know anyone? Going in a lift? Making a phone call that you’ve been dreading? How might the 7 Step Action Plan help you to conquer your fear or change a behaviour habit? Read my next blog post about applying the 7 Step Action Plan to some “everyday scenarios” that commonly get our nerves going and our minds racing.